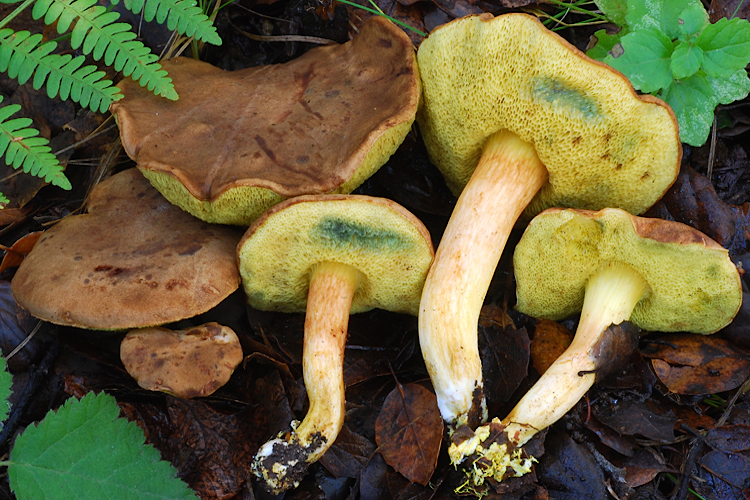 Xerocomus boletes have dry, felty or velvety caps, yellow pores that bruise blue (sometimes slow or absent), and variably smooth or very coarsely reticulate stipes. Those in our area show yellow basal mycelium. All appear to be mycorrhizal. There seem to be relatively few species in California, but their taxonomy remains vexed due to unclear proper names (we are currently using borrowed European names) and variable morphology. Important identification characters are stature, overall coloration, and fleeting macrochemical reactions to ammonia (the latter of unclear and even suspect utility).